Ecologist Lindsey Rustad sculpts ice forests. 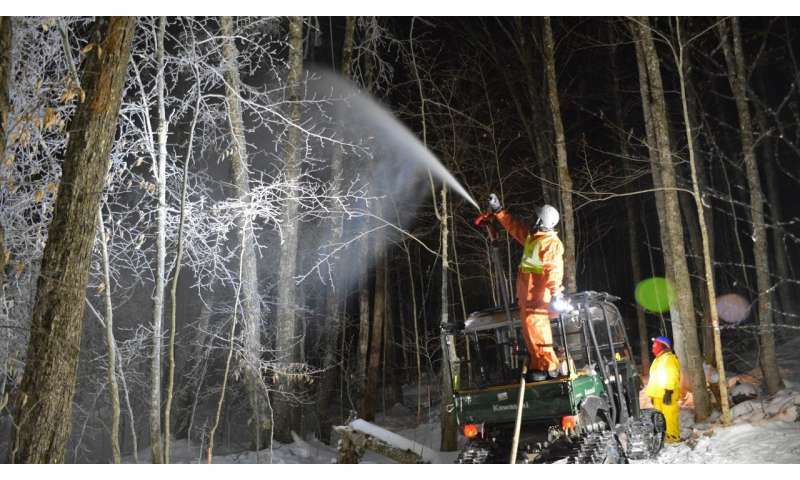 She's not a sculptor by trade, but in her latest ecology experiment, her team sprayed water over a portion of forest during the coldest part of the night. Within hours, the water froze to the branches, simulating an ice storm. Rustad, a scientist with USDA Forest Service, is concerned about evidence suggesting climate change will bring severe ice storms more often. Rustad wants to know how this will affect forest health. "I'm a master forest manipulator, but this experiment, without a doubt, was the most difficult," says Rustad. Rustad has been manipulating forest for decades, testing the effects of climate change in a controlled setting. She's acidified forests and created other chemical disturbances to gauge how resilient forests are to change. But although scientists have studied the impacts of forest fires and acid rain, no one's looked closely at the impacts of ice storms. "If you live in a place like Maine or New Hampshire, you see these events almost annually," says Rustad. "And every five to ten years we have big ones." Ice storms can wreak havoc on communities. Frozen limbs, dragged down by the weight of the ice, can snap off and fall on cars, homes, and power lines. 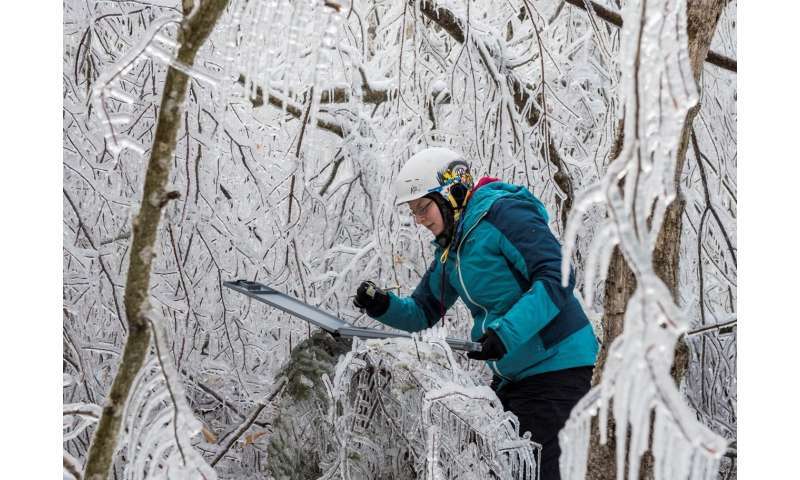 But scientists aren't sure how ice storms affect long-term forest health. "It's not easy to study ice storms because they're difficult to predict," explains Rustad. "We didn't want to become storm chasers, so we decided to make our own." Rustad partnered with scientists from throughout New England and conducted the experiment at the 8,000-acre USDA Forest Service Hubbard Brook Experimental Forest in the White Mountains of New Hampshire. 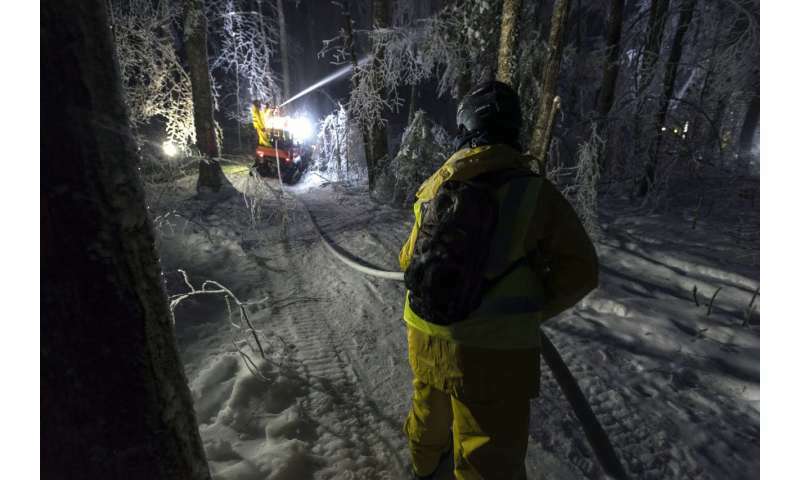 They used fire hoses to pump water from a nearby creek and sprayed water onto different sections of the forest. Each section was the size of a basketball court. The team sprayed various amounts of water to create a light icing (quarter-inch), a significant icing (half-inch) and an extreme icing (three-fourth inch). The team will compare the frozen forests to nearby, undisturbed forest area. They'll compare forest health indicators: soil nutrient cycling, forest regrowth, and wildlife. The research will join a decades-long project on how a severe ice storm in 1998 affected northeastern U.S. and Canada. The research project will finish next year, but Rustad has a few hunches about the results. She says a light icing can be good for forests. A light ice storm, with a quarter-inch ice coating, can thin out branches and make way for new growth. Night icing during an ice storm experiment at the Hubbard Brook Experimental Forest, NH. Credit: Lindsey Rustad. "Trees have a certain amount of stored carbon," she says. "With one icing, they have enough reserves to re-foliate and recover." But back-to-back severe icing events can be devastating to a forest's carbon reserves. Climate change scientists forecast that ice events will increase in frequency. "Our forests are tremendously resilient," Rustad asserts. "I grew up in the days of acid rain. So scientists embarked on a couple decades of exhaustive research and we passed the Clean Air Act, and reduced sulfur emissions by 80%." The team studying ice storms is interdisciplinary. One group will use the data to improve a climate prediction model by incorporating extreme ice events. Another group will study soil properties and other forest health indicators. The team also included the input of public utility, recreation, and safety groups. Rustad also hopes the research will be useful for devising new ways of warning the public about extreme events.